Flatsome is the number one WooCommerce WordPress theme at Themeforest. Since its release this theme has received over 2500 ratings and 32k+ sales. It was inspired by modern e-commerce designs with a mobile first approach – making it really stand out from other Themeforest themes. It comes with stunning styles such as minimal, classic, mega shop etc. You can easily choose these styles from the theme options panel. StudioPress’ AgentPress Pro has an intuitive design, powerful functionality, and smart listings to promote your business. This is a multipurpose theme perfect for real estate agents who want to It offers buyer-friendly layouts that allow you to rise above the market and achieve results by showcasing your professional services and up-to-the-minute resources. This theme is perfect for real estate agents who want to promote their business with a beautiful website. Also, we found the theme to be easy to use with just enough customization options. It is built on the Genesis framework, which is fast, lightweight, and well-coded. Pre-made templates, including: Archive Page, Blog Page, Columns Page, and Landing Page. Genesis framework is a very accessible theme filled to the brim with theme options to enhance your website the way you want it. With up to three-columns support, left/right sidebar options, header/background/menu customization and multiple page layout options, you can design each page individually on the go. The theme also comes with page templates to suit your purpose. The theme is well optimized and built with SEO compatibility with a mind so you can always stay on the top of the online charts. Furthermore, the theme also comes with dozens and dozens of child themes you can easily implement without any difficulty, fit for any kind of website design imaginable. Diversity is the name of the game and with the multitude of theme selections of Genesis, we can assure that you will win that game. The number 1 selling WordPress theme, Avada is an all-capable easy-to-use theme. ‘Coding knowledge not required’ is the name of the game for this theme. The combination of its 3 native plugins, Fusion Builder, Fusion Theme options and Fusion Page options make it that one can easily modify every webpage individually, top to bottom without a single iota of web codes understanding. Furthermore, the theme comes with WooCommerce support and plugin so business owners can freely build their company’s web Frontend with barely any effort. The theme also has a dedicated support stand-by at all times to help its users as well as a detailed documentation to cover every possible issue a user can get. 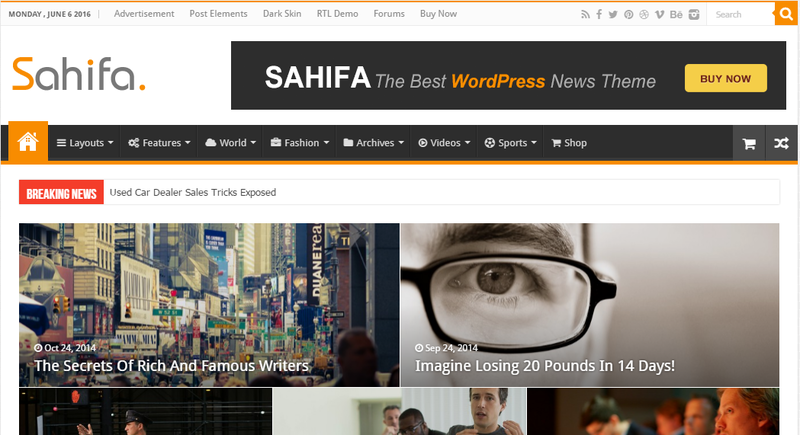 Sahifa is a blogging, magazine-oriented theme with plenty of options for customization and no coding necessary. Developed by TieLabs, Sahifa is a best-seller on Themeforest. The theme is great from a business perspective as well since it comes with efficient AdSense and banner ads with over 14 predefined and 5 custom spots for global advertisements. Also, you can include ads on individual pages or posts using the tagDiv Composer and the dedicated elements such as Ad Box or Single Post Content. The Sahifa theme comes with support for almost every possible content type and comes with native video support for YouTube, Vimeo, and Dailymotion.